Home Digital Leader Awards The Digital Leader Award winners have been announced! Each year CTN gives awards in the following categories: Digital Champion, Digital Changemaker, Digital Inclusion In The Community, Digital Bridge Builder, and Digital Amplifier Award. 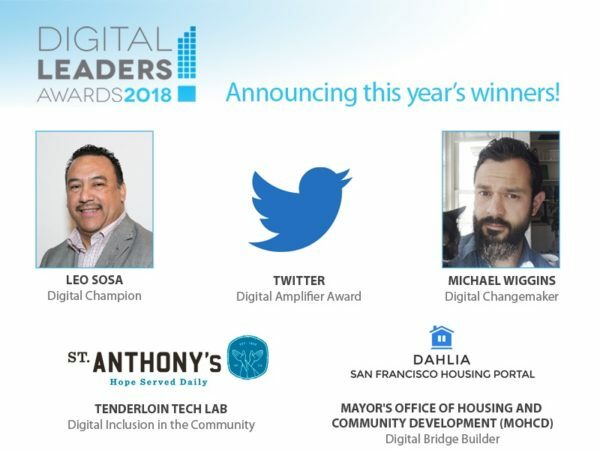 There’s still time for you to join us for this inspirational event, happening on May 9 at Twitter HQ, to honor San Francisco’s champions of digital inclusion. Purchase your tickets today! Thanks to our event sponsors: Twitter, Accenture, AT&T, Cornerstone, Polsinell, Monkeybrains, Zelle and Microsoft!